A tech company is launching a new type of stroller which looks to have more bells and whistles than some cars. 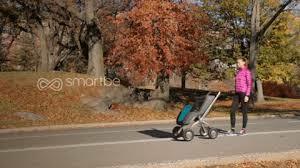 Smartbe, a tech start-up company is selling the hands-free stroller for $3,000 and orders are starting to come in. The stroller is deemed the “first intelligent stroller” and has motion-tracking sensors built into the handle. The sensors allow the stroller to follow your movements and create the self-driving technology. Other features include self-stopping functions, cell phone charging capability, climate control options, a webcam, wireless speakers, and light signals. I’m honestly not sure how I feel about this latest advance in parenting technology, but what do you folks think about a self-propelled stroller? I gave up using my baby monitor during the first few weeks, so maybe I’m not the typical tech-savvy mom. What do you think? Please share your thoughts on MomsPumpHere.com, on our Facebook page or Tweet us your opinions.